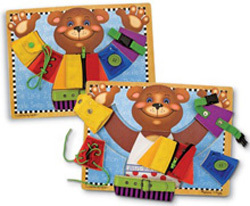 This wooden bear is always smiling, but he's happiest when fully dressed! Getting dressed won't be such a puzzle once zipping, buckling, snapping, lacing and tying, and other dressing skills are mastered. Each skill is contained on a separate, wooden puzzle piece for easy practice. Helping this bear get dressed will help your child master the self care skills so critical to their growing independence! 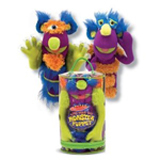 Mellissa and Doug's Basic Skills Board wil help devlop fine motor and life skills, hand-eye coordination, and shape and color differentiation skills. Size: 15.5" x 11.5" x 0.5"
Colourful wooden train with removeable shapes. Designed with a continuous loop plastic handle which automatically reopens them when pressure is released, these Easi-Grip® Scissors are a beneficial tool for children with a weak grip. These 3” learning scissors are perfect for little hands! Magnetic Match Rings is the fun way to learn about magnetism, help develop visual matching skills, patterning, and improve eye-hand cooridnation. 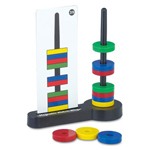 This matching challenge game has 40 pattern cards for individuals to mimic by stacking magnetic rings that attract or repel in the appropriate order.